Mario Testino trains his discerning lens on fashion's latest obsession - the Orient, for the March 2013 issue of British Vogue. Entitled "Orient Excess", the editorial features four of the modelling industry's most promising talents; Chinese models Fei Fei Sun and Sui He, and Korean newcomers Sung Hee Kim and Ji Hye Park. 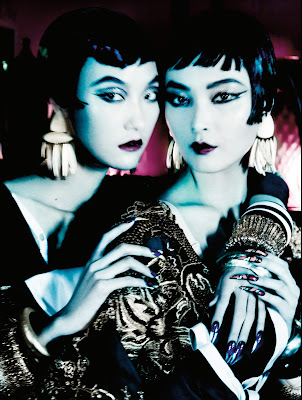 With many designers diverting their attention to the East for inspiration during the Spring/Summer 2013 season, there has been a recent proliferation of Asian faces appearing in the pages of high fashion glossies. Stylist Lucinda Chambers creates high drama, decking out the cast in looks by Prada, Gucci, Emilio Pucci, Giles, and Etro amongst others. The current wave of Asian models in Vogue is a far cry for the days when it seemed the industry had room for all but one top Asian model every few years. Major props must be accorded to Irina Pantaeva, Navia Nguyen, Ai Tominaga and Du Juan for paving the way for the current generation of Asian modelling stars. From Fei Fei's otherworldly allure, to Sung Hee Kim's cherubic beauty, the razor sharp angularity of Ji Hye's features, and Sui He's simply intoxicating magnificence, it is easy to understand why the fashion world has finally begun to recognise the true diversity of Asian beauty.